QUICK, EASY ASSEMBLY - Instructions and all necessary tools included for smooth assembly. If you find any damage caused in transit, please contact us to help you immediately! Ergonomically Rocking Design- The rocking arc base has designed with perfect angle and finally fits all people. The ergonomically designed arc base effectively helps you relax your body. You will have a super smooth and comfortable rocking experience. 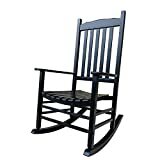 Durable Solid Wood Structure- The whole chair uses solid wood as frame material, not easy to break or warp. 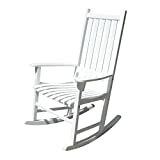 It ensures the long life span of the rocking chair and you don't have to replace it annually. Extra Reinforcement Wood Bars- Each side of the chair has extra reinforcement bars to make the chair more solid and stable. With these bars, all legs firmly connects together and the whole structure is super solid even with large weight. Widened and Relaxing Armrests- The armrests are thoughtfully designed with widened space in the front where your arms rest on. It is super comfortable with the widened armrests and gives your arms a real relaxation. Carefully Polished and Engraved Corners- Not only the chair is super useful and functional, but also has a charming and chic style with delicate designs like the polished and engraved parts at each chair corner. These designs make this chair look superior and in high grade. 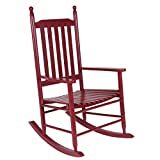 ENJOY DREAMY GENTLE SWINGING - Sit down comfortably and feel the smooth of the glider, gentle backward and forward motion of this exquisite chair. No rough rocking back and forth; just a soft gliding like a breeze; the perfect gift for you, your significant other, or your loved ones! EVERYONE LOVES A GREAT SWING CHAIR - Children and adults, men and women, every member of your family, and your friends; don't be surprised if they start taking turns on it! Thankfully it was designed so that two people can sit comfortably on it (size: 48.5''L x 28''W x 34.2''H) and can take up to 440 lbs (200 kgs) of weight - so sit away without worrying! 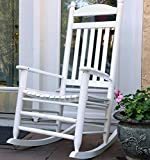 KICK BACK & ENJOY THE MOMENT - There is no better way to blow off some steam after a tiring day, than getting a nice cup of coffee or cocoa, along with your favorite magazine or book, and sitting comfortably on your new patio rocking chair. Close your eyes enjoy the gentle gliding motion and all your stress will simply melt away! 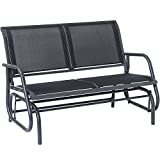 THE PERFECT ADDITION TO YOUR GARDEN, BALCONY, OR PATIO - If you want a final touch to your gorgeous garden, backyard, balcony, or patio, this fantastic glider seat will do the trick. Plus, it's not just a decorative addition to look at, but rather a useful piece of furniture that both you and your guests will be fond of! 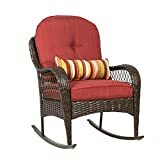 Overall Dimension: 24"(L) x 28.5"(W) x 38"(H); Weight Capacity: 250 lbs. 【Clean & Sophisticate Design】 This hand-woven rich black wicker outdoor set fits a variety of living space styles and settings. 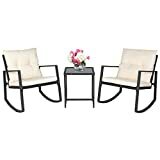 This is the perfect patio set if you have a limited outdoor space, you can still enjoy a cup of coffee under the sun, or have a few drinks with friends! 【Ergonomically Designed Chair Height】 This outdoor lounge chair set comes with sponge padded seat cushions and back cushions. Designed with comfort in mind, it has extra wide seat width and depth. Ergonomically designed chair height for reduced knee bending when you sit in. 【All-Weather Synthetic Wicker】 Engineered all-weather synthetic black wicker to mimic the variegated look and feel of natural wicker. Carefully designed complex weave patterns for added strength and durability. The rich color provides a premium outdoor look. 【Premium Olefin Fabric】 Featuring durable beige olefin outdoor fabric that is strong and easy to clean. At the same time, the fabric texture remains soft to the hand & cushion covers remove with a quick zip! 【Efficient Assembly】 Minimal assembly (10-15 minutes). All necessary hardware and instructions included. Feel free to let us help anytime during the assembly.